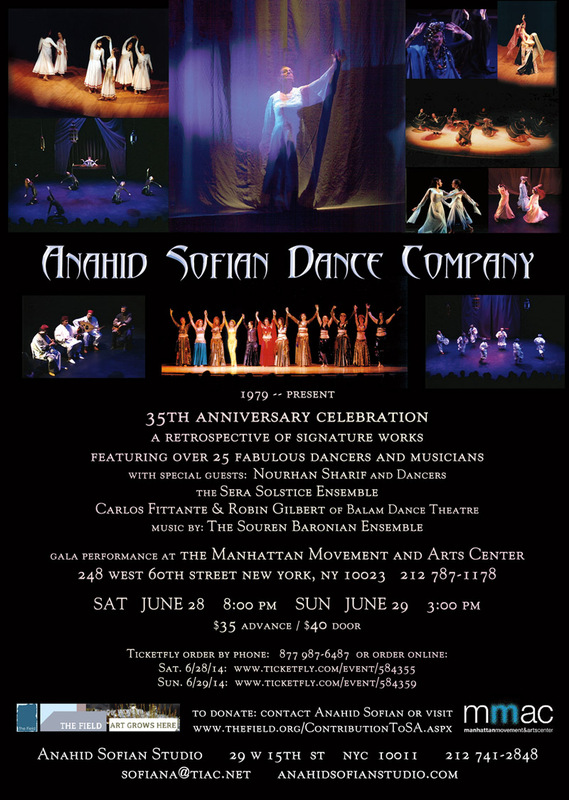 Anahid Sofian is a Sponsored Artist with The Field, a not-for-profit, tax-exempt, 501(c)(3) organization serving the New York City performing arts community. 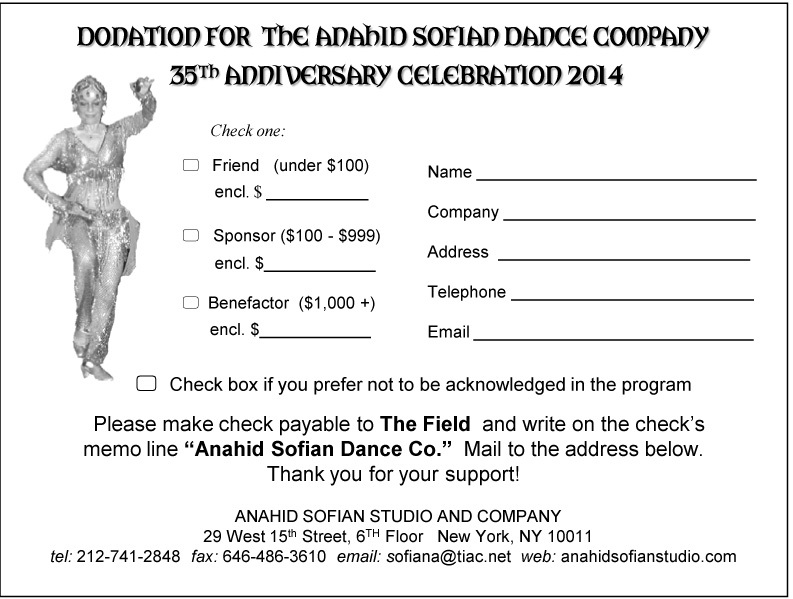 Contributions to The Field and earmarked for Anahid Sofian are tax-deductible to the extent allowed by law. For more information about The Field contact The Field, 75 Maiden Lane, Suite 906 New York, NY 10038, (212) 691-6969, fax (212) 255-2053, www.thefield.org. A copy of The Field's latest annual report may be obtained, upon request, from The Field or from the Office of the Attorney General, Charities Bureau, 120 Broadway, New York, NY 10271. Alternatively, you may use the form below and mail your donation. 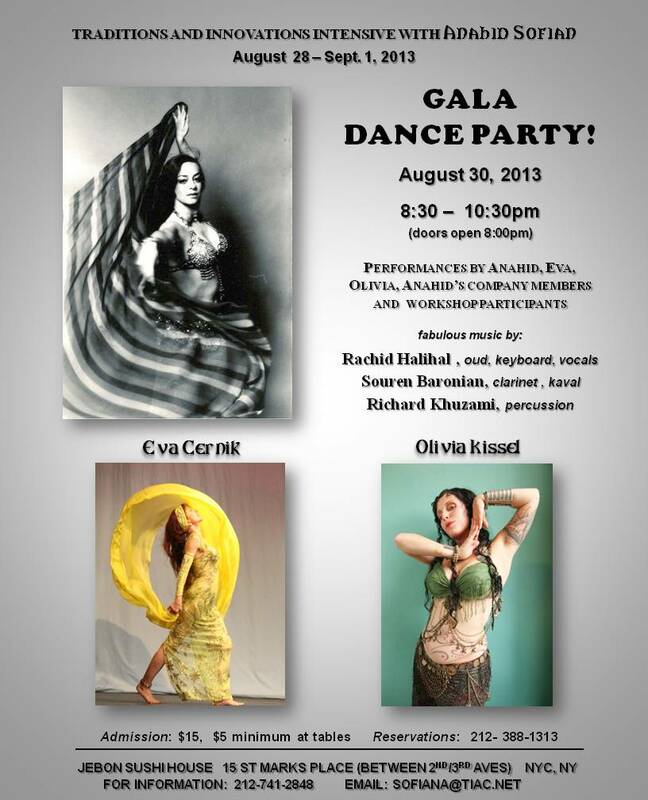 August 31, 2012 (Friday): Gala Dance Party for Traditions and Innovations Intensive, with Eva Cernik, Sira Melikian, Sofian Company Dancers and Intensive Participants. 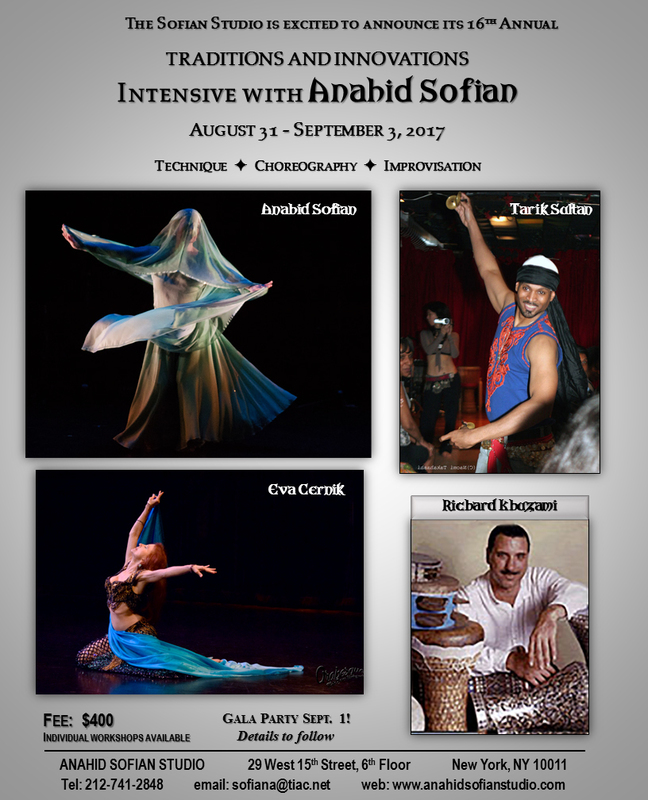 August 30 - Sept. 2, 2012 (Thursday - Sunday): Traditions and Innovations: Intensive with Anahid Sofian including Workshops in Oriental, Arabic, Turkish and Armenian Dance. 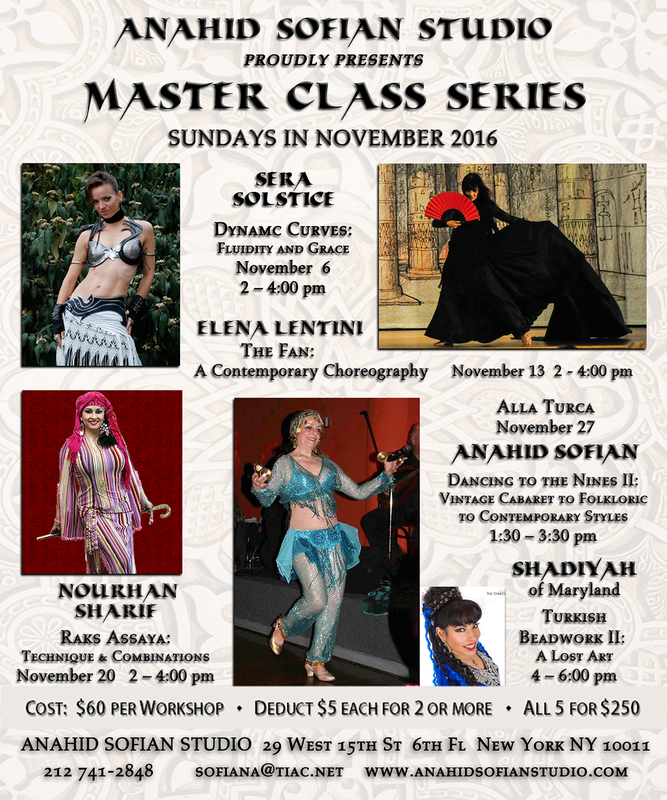 Guest instructors: Eva Cernik and Sira Melikian. 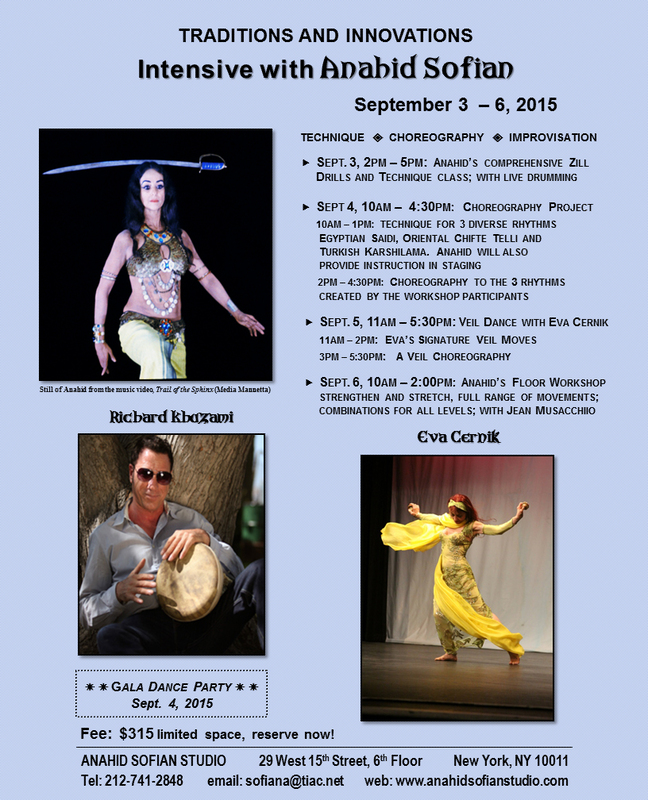 More information will be available soon or contact Anahid at sofiana@tiac.net. 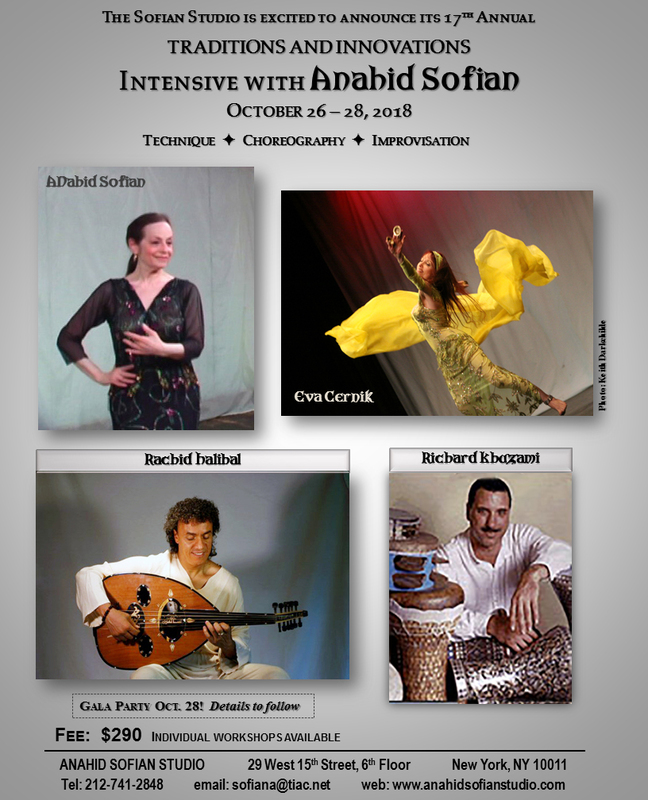 November 5, 2011 (Saturday): Harmonic Motion Workshop “Buleria Mora” with Myriam Eli and Joe Zeytoonian at Anahid Sofian Studio, 29 W. 15th St., 6th Fl. from 1:00 to 3:00pm. 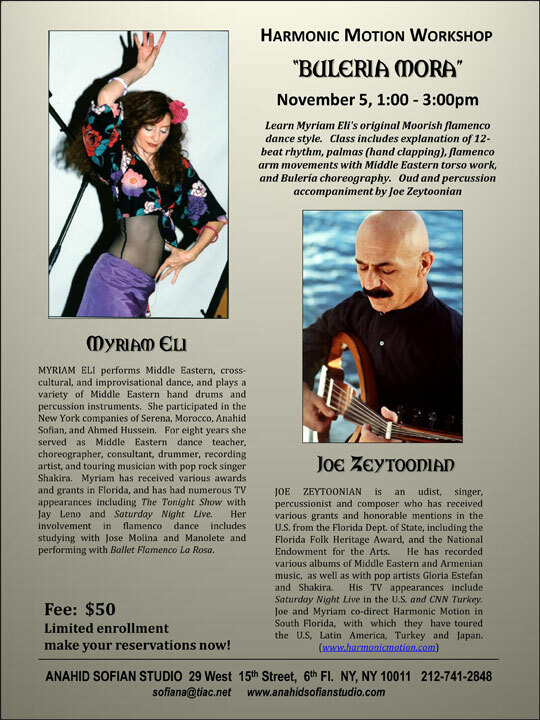 Myriam will teach her original Moorish flamenco dance style. 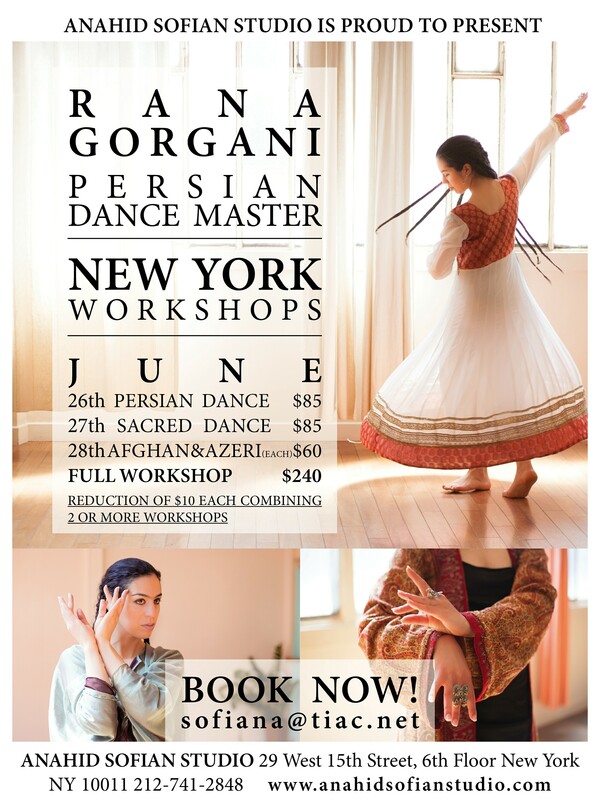 The class includes explanation of 12-beat rhythm, palmas (hand-clapping), flamenco arm movements with Middle Eastern torso work and Buleria choreography. Oud and percussion accompaniment by Joe Zeytoonian. Fee: $50. 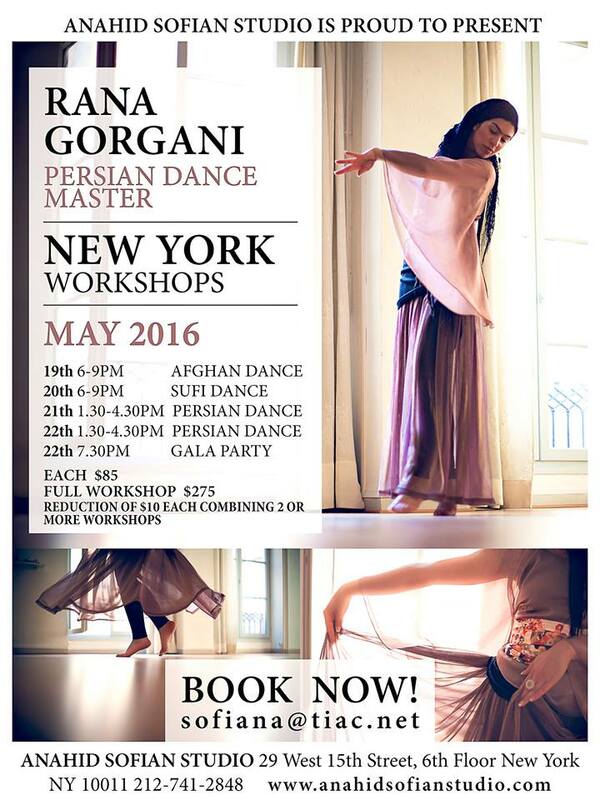 Limited enrollment; make your reservation early by calling Anahid at (212) 741-2848 or e-mail sofiana@tiac.net. 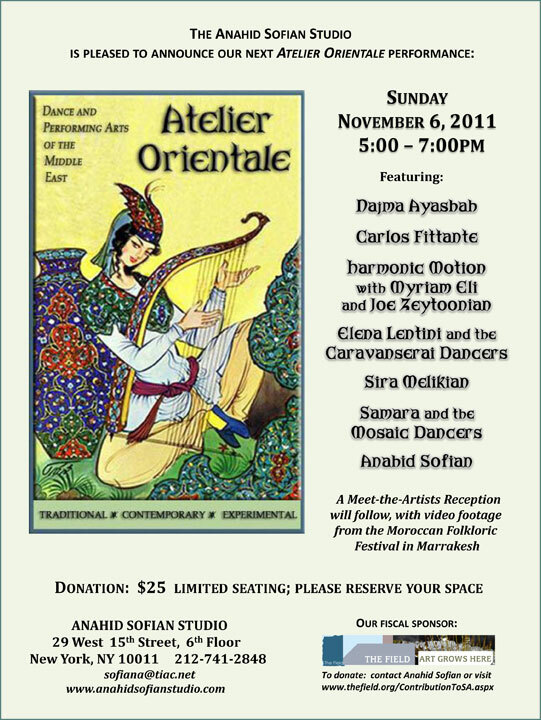 November 6, 2011 (Sunday): Atelier Orientale performance at Anahid Sofian Studio, 29 W. 15th St., 6th Fl. 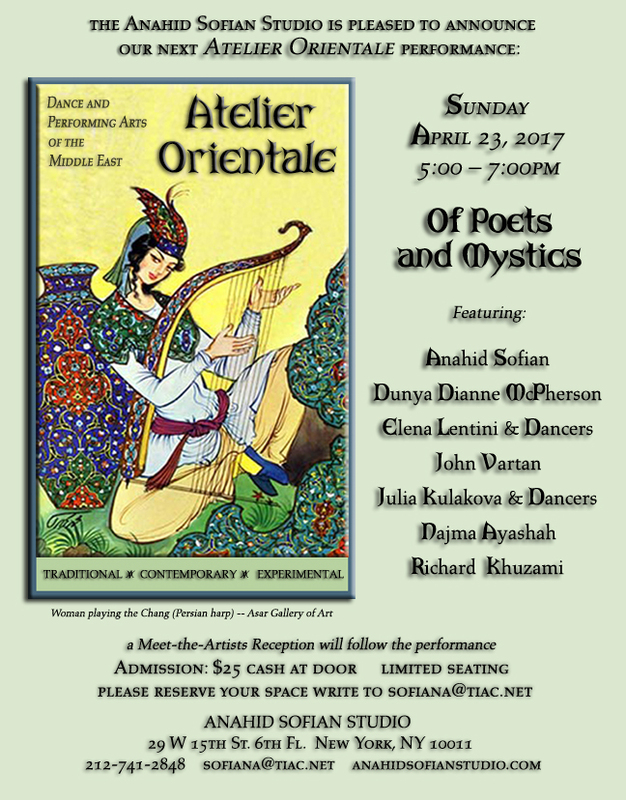 from 5:00 to 7:00pm featuring Najma Ayashah, Carlos Fittante, Harmonic Motion with Myriam Eli and Joe Zeytoonian, Elena Lentini and the Caravanserai Dancers, Sira Melikian, Samara and the Mosaic Dancers, and Anahid Sofian. 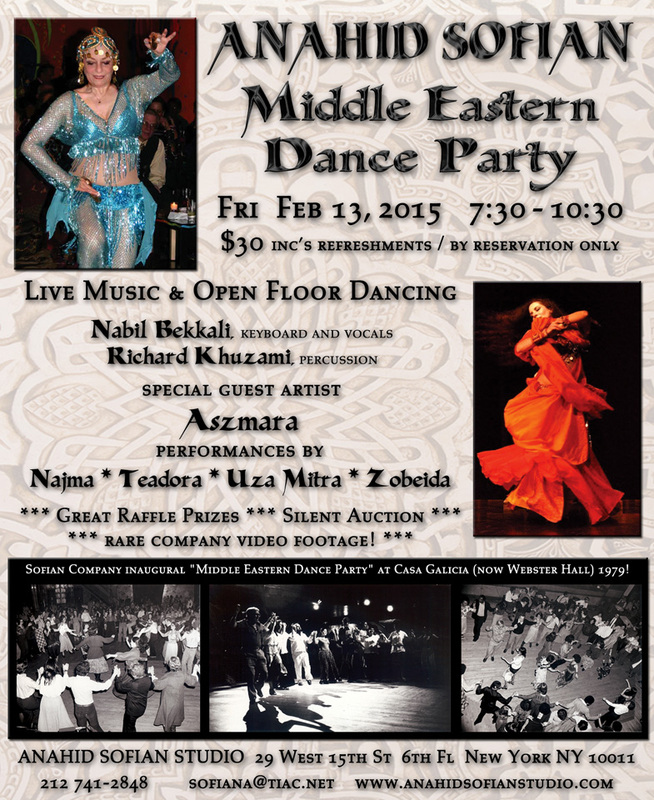 A Meet-the-Artists Reception will follow, with video footage from the Moroccan Folkloric Festival in Marrakesh. Donation: $25. Limited seating; please reserve your space. 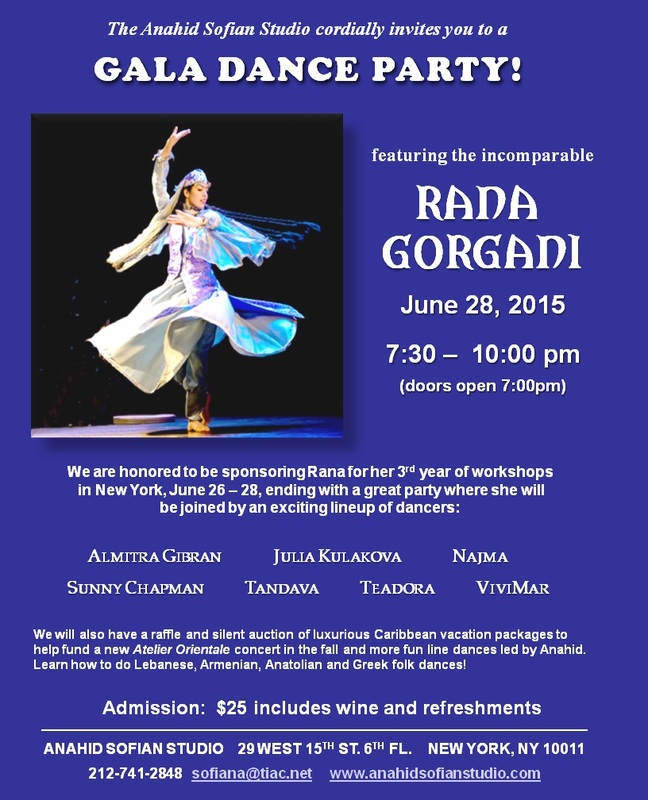 Phone (212) 741-2848 or e-mail sofiana@tiac.net. 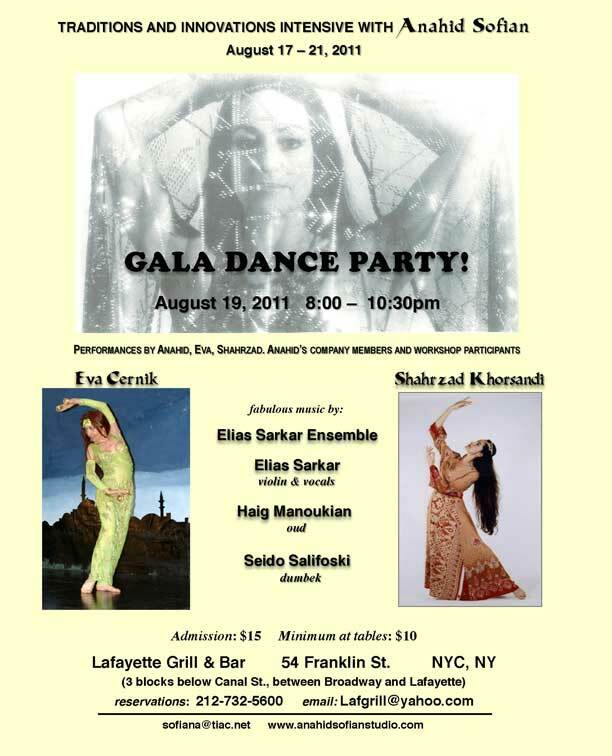 August 19, 2011 (Friday): Gala for Traditions and Innovations Intensive at the Lafayette Grill & Bar, 54 Franklin St., from 8:00 to 10:30PM. 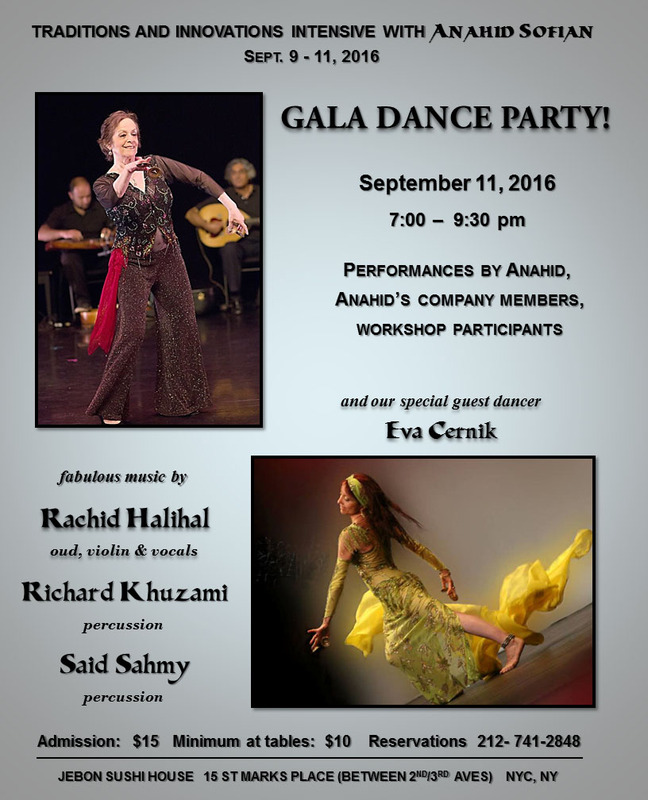 Performances by Anahid, Eva Cernik, Shahrzad Khorsandi, members of Anahid’s company, and workshop participants. 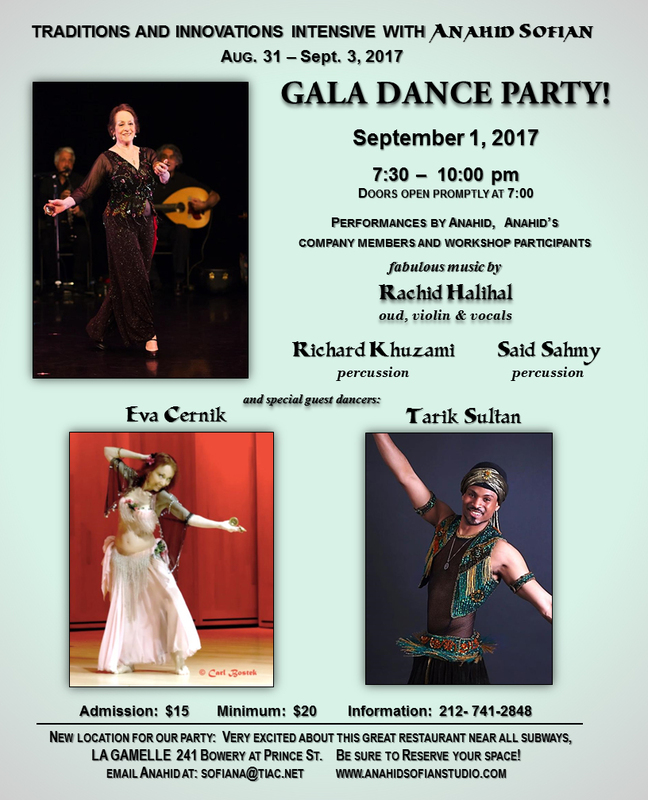 Music by the Elias Sarkar Ensemble featuring Elias Sarkar (violin & vocals), Haig Manoukian (oud), and Seido Salifoski (dumbek). 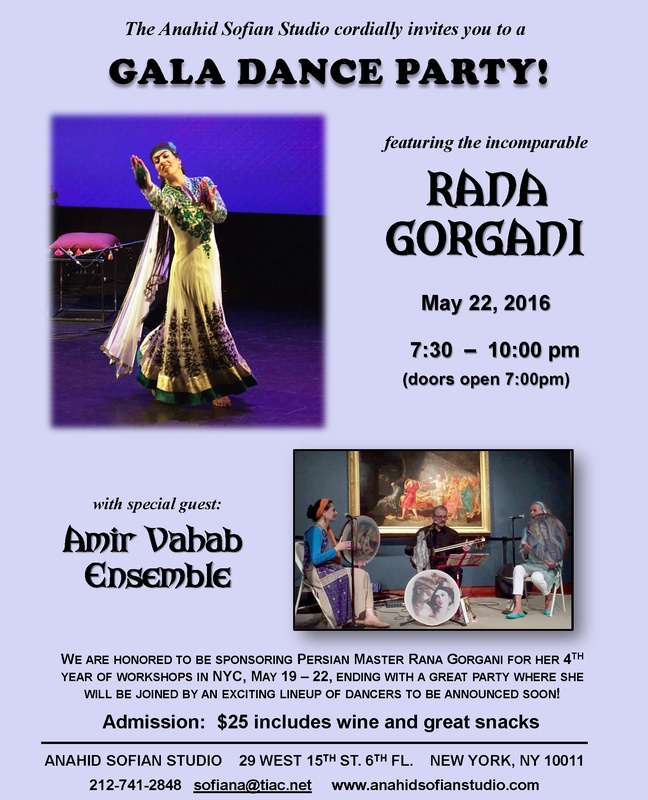 Admission is $15; table minimum is $10. For reservations call the Lafayette at 212-732-5600 or e-mail Lafgrill@yahoo.com. 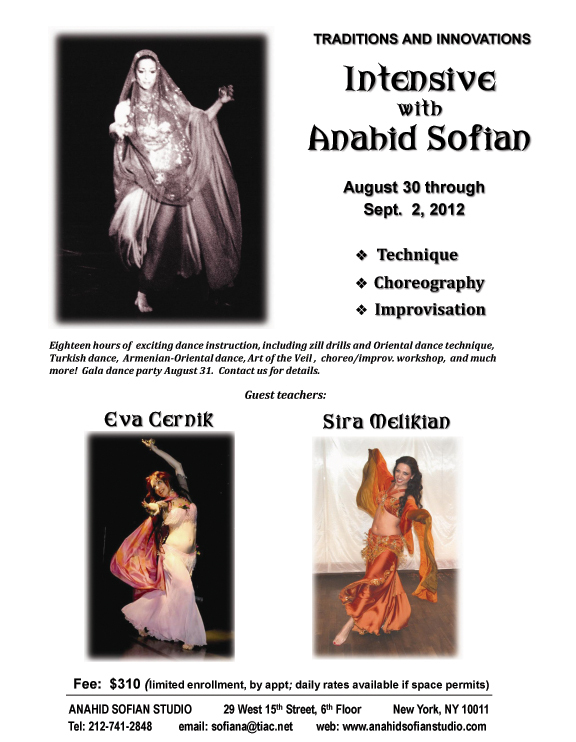 August 17 - 21, 2011 (Wednesday - Sunday): Tradition and Innovations: Intensive with Anahid Sofian including Workshops in Oriental, Arabic, Turkish and Persian Dance. 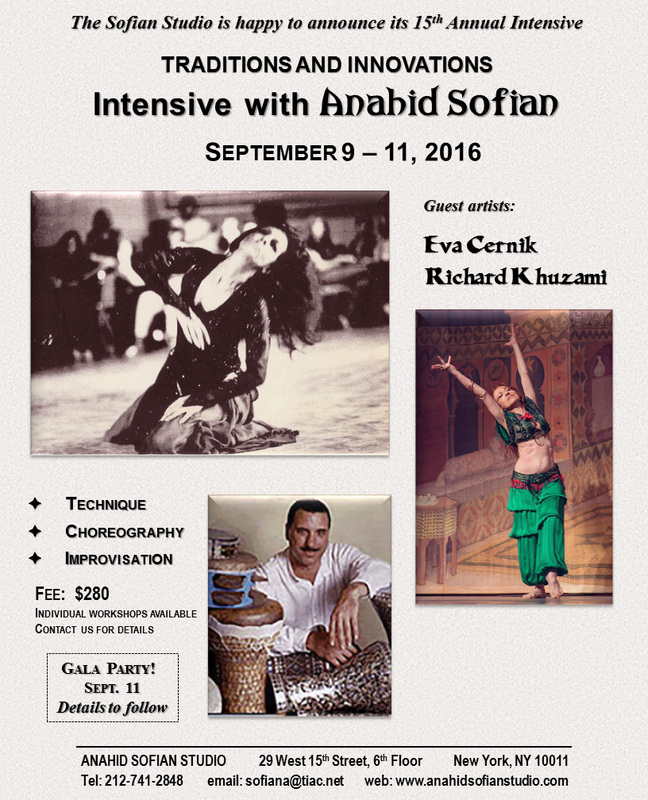 Guest instructors: Eva Cernik and Sharazad Khorsandi. 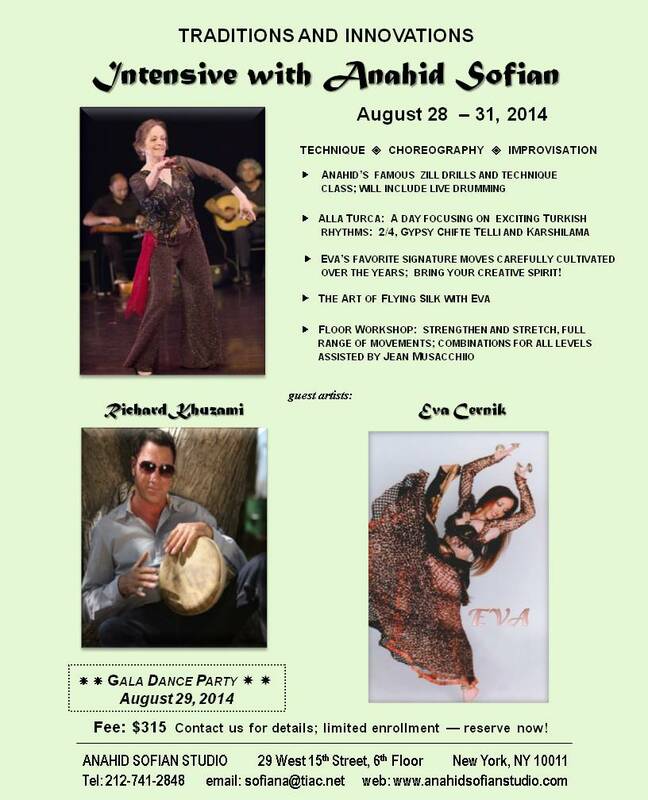 More information will be available soon or contact Anahid at sofiana@tiac.net. FLYER. 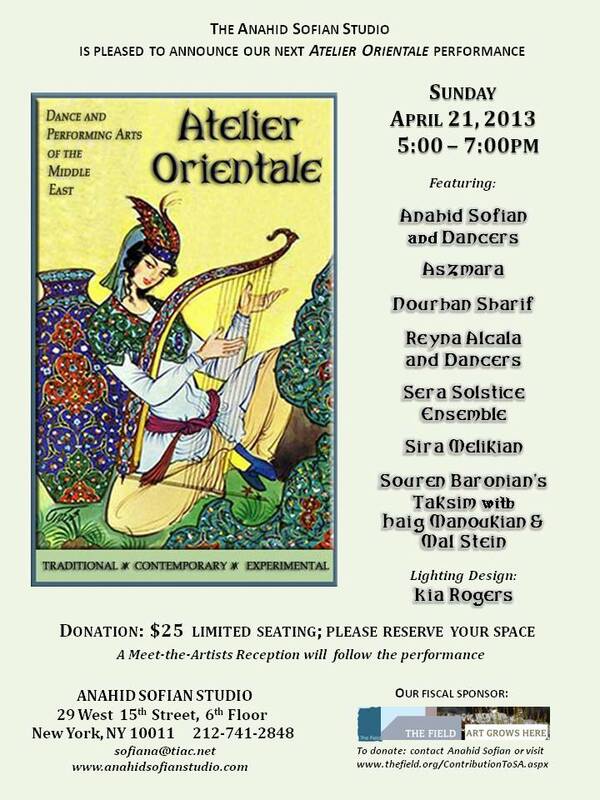 June 19, 2011 (Sunday): The Anahid Sofian Studio presents Atelier Orientale: Dance and Performing Arts of the Middle East, the inaugural event in an innovative quarterly performance series. 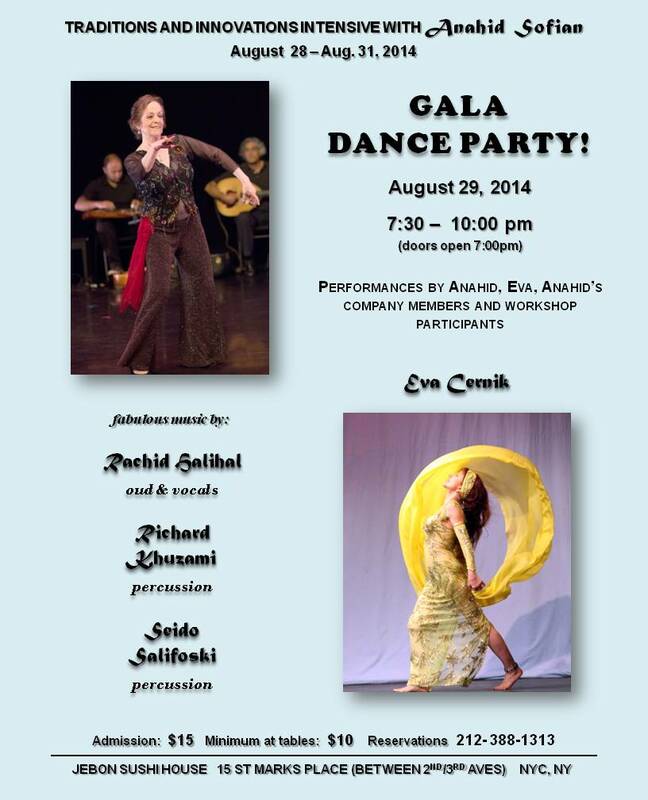 This multi-media event is being staged at the Anahid Sofian Studio, 29 West 15th Street. 6th Floor, from 5:00 to 7:00PM and will feature rare dance videos and performances by Anahid Sofian, Aszmara, Azza Amon & Dancers, Jean Musacchio, Manhattan Tribal, Nadia Maria Michaels, and Sira Melikian. A Meet-the-Artists wine reception will follow. Donation:$20. Seating is limited so please reserve your space. The Field is this project's fiscal sponsor. FLYER.